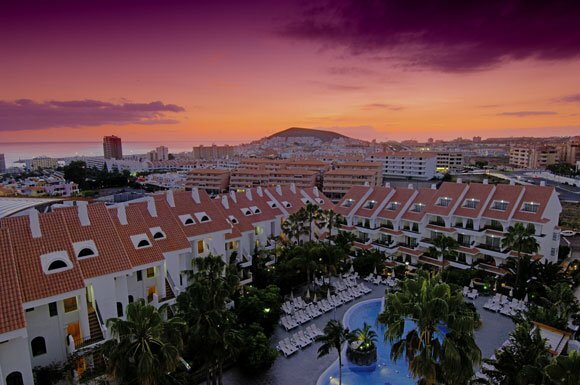 Hotel Paradise Park Resort & Spa Situated not far from the original marine village of Los Cristianos in an elevated position we enjoy unrivaled views of the surrounding areas, beaches and the sea. We are just 15 Kms away from the South Tenerife airport and 1.5 Kms away from the beaches of Playa las Vistas. We also have a shuttle service that runs to the town centre of Los Cristianos and the local golf courses Los Palos and Costa Adeje in Playa de las Americas are just a few minutes away by car. To rent a car in Tenerife click here! Furthermore Canarias.com has an office in this hotel providing you with a rent a car service and a great selection of excursions to make your stay even more pleasant without having to look anywhere else. For our disabled guests we have adapted accomodation with wide doorways which also have adapted bathrooms. The accomodation is close to reception and we have lifts at your disposal for moving between floors. In addition, all the public areas have been adapted including bars and resturaunts to make your stay that much more enjoyable. With 394 rooms, 6 pools, 2 resturaunts, 4 bars a Spa and a solarium on the 8th floor our greatest asset is our service and how we care for our guests. · Satellite TV. · WI-FI. · Individually controlled air conditioning. · Direct-dial telephone. · Bathroom with bathtub and walk in shower and hairdryer. · Balcony or terrace with pool view. The superior rooms have everything you need for an unforgettable stay at the Paradise Park Resort & Spa, a simple unit is to provide convenience for our customers. Includes a balcony with pool or sea view. · Individually controlled air conditioning. · Fully refurbished to a higher standard. · Twin beds. · Direct-dial telephone. · Bathroom with walk in shower and hairdryer. · Satellite TV. · WI-FI. · Balcony with sea or pool view. The Premium Salon in the Paradise Park Resort is one of the favorites among our customers. This type of room has a separate bedroom and a sofa-bed, but the difference lies in the warmth of its atmosphere and large terrace. · Lounge with sofa bed. · Small kitchinette. · 2 Individual beds. · Air conditioning. · Bathroom with bathtub and hairdryer. · Telephone with direct external line. · Satellite TV. · Balcony or terrace. We have new facilities available for children, like the miniclub or the childrens play area. *Some services are paid directly at the hotel. Do you need to book a flight to this or other destinations? Click here to book at best available rates!